My Foxy Notebook currently holds two Notebook Inserts, two other previously purchased journals that contain information I need on hand, and a dashboard insert. I love the dashboard because it lets me change out the covers as the mood strikes. I decorated this one with the lovely Floral stamps (design 1). The first page in my first insert is my bujo key, and following that is my June monthly spread. 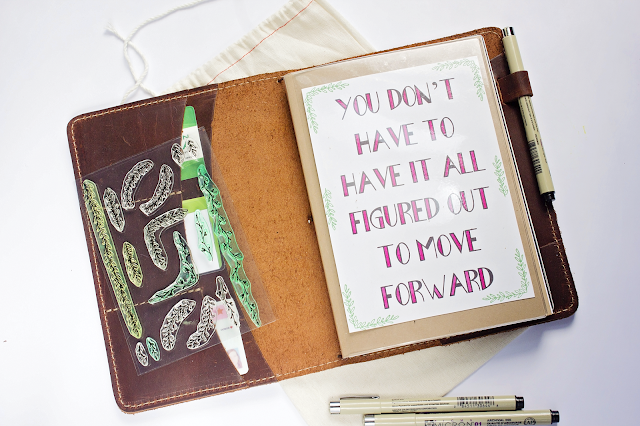 I used several stamp sets in this layout. For the large boxes at the top, I used one of the columns from Column Set 1. The squares are stamped with the Square Set. A trick to lining them up (which I actually thought of AFTER I finished this entire page!) 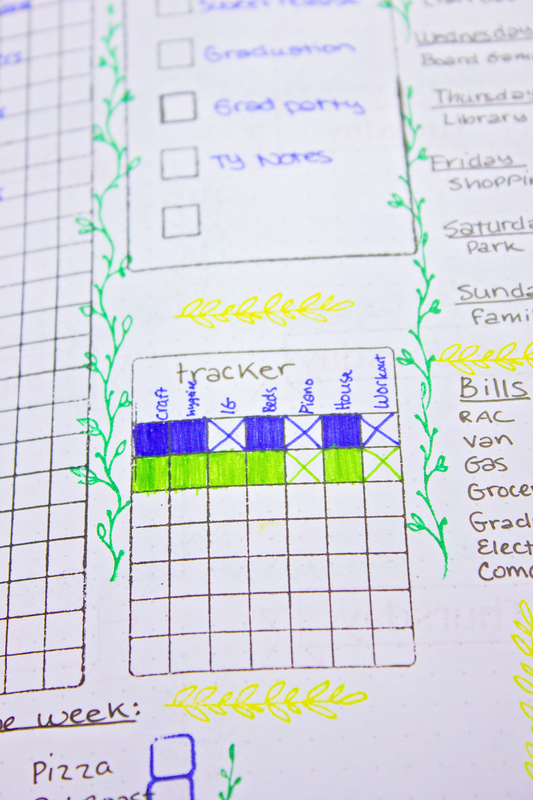 is to use a t-square ruler and lightly trace a frame work in pencil. I ended up just eyeballing it. 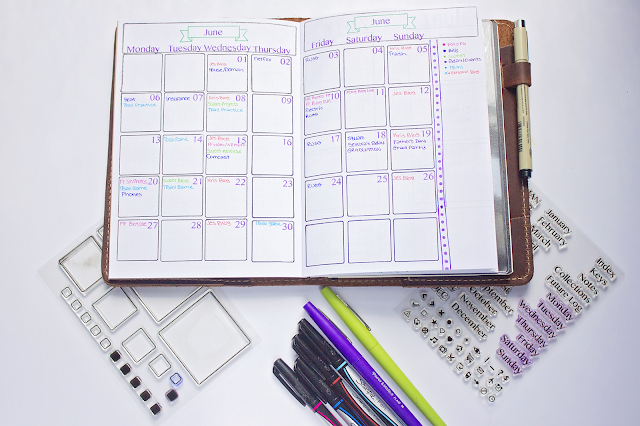 The days of the week and June header all come from the Bujo Basics Part 1 set, while the banner around June and the numbers are all from Bujo Basics Part 2. 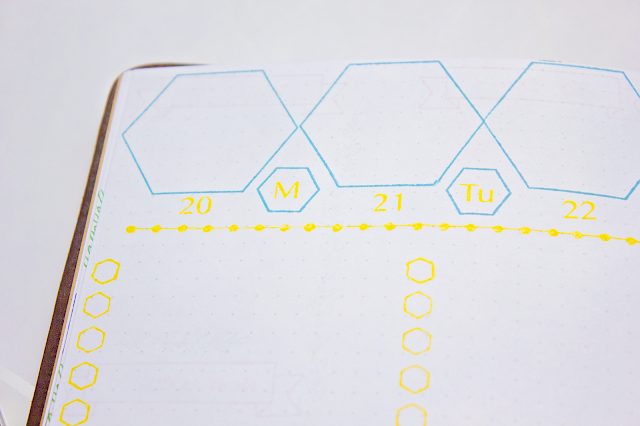 Finally, I used Bujo Dividers and Borders Set 2 to separate my days from my notes section. To stamp the borders, I used my long block from Fiskars, but it was hard to hold, and the bottom part of the border was difficult to align. I recommend getting a block with a good grip like this one from My Sentiments Exactly. 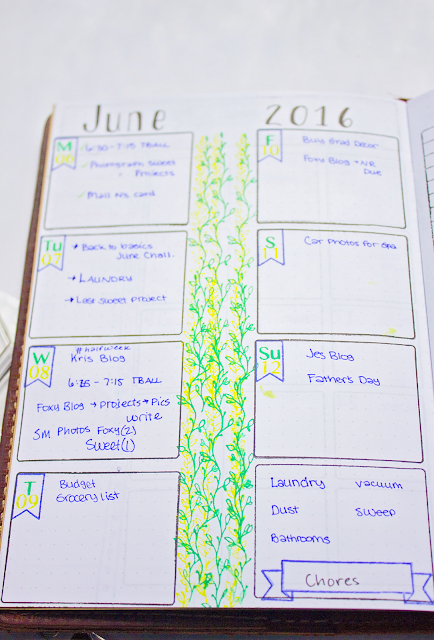 After my monthly calendar, the next few pages are my weekly spreads for June. 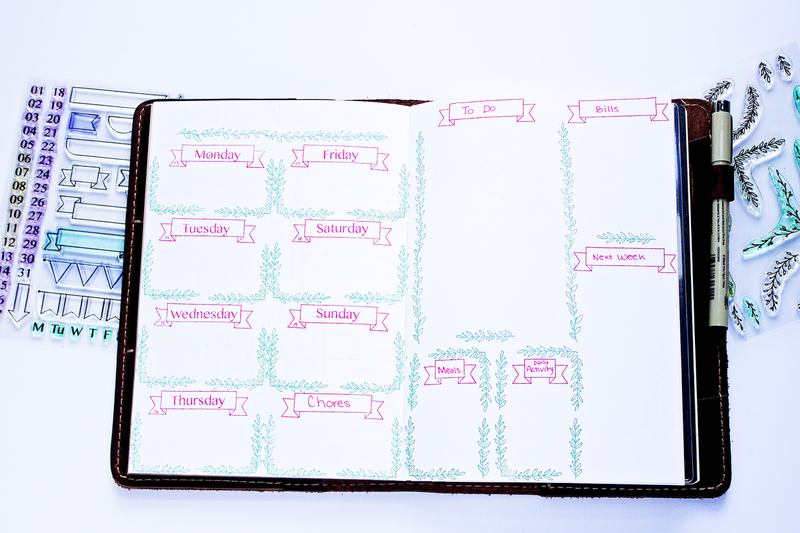 Many people plan day by day in their bujo's, but that doesn't work for me. 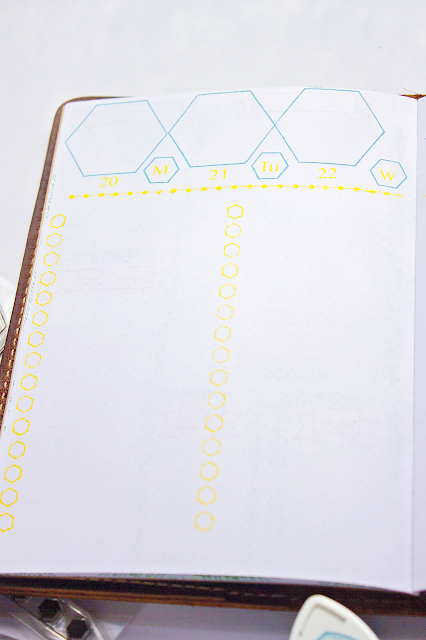 I stamp out a basic weekly layout, and if I end up needing more room for to-do items, I create a master to-do list on the next available page. 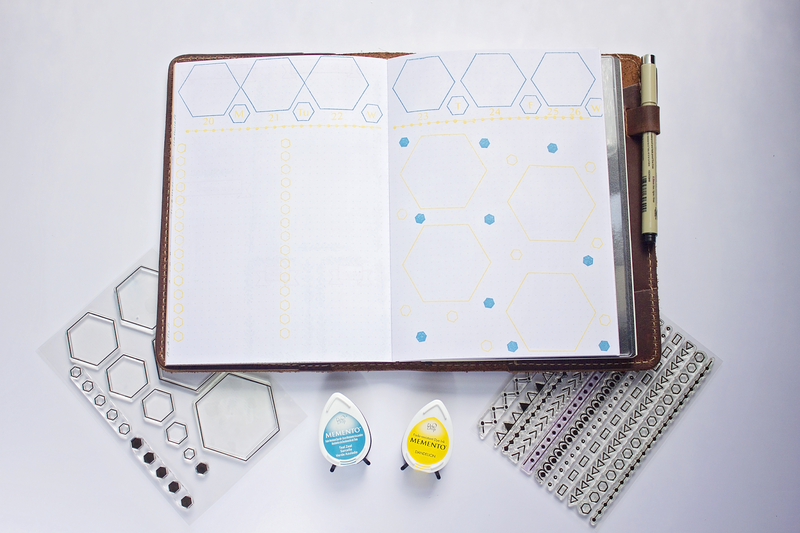 For June, I chose to make several weekly spread layouts to give you an idea of all the different things you can do with the Foxy Fix stamp sets. I haven't listed every individual set, but you can find all the sets I used here: http://www.foxyfix.com/collections/clear-stamp. This tracker was created using the mini calendar stamp found in the Tracker Set. You can only track seven things at a time, but that's perfect for me. Here is a close up of my weekly spread. The boxes are not all lined up perfectly, so this is where that t-square I mentioned would be helpful again. Kristine Bryant, one of the other two designers, challenged me to do a layout using only the new elements sets. Challenge accepted! 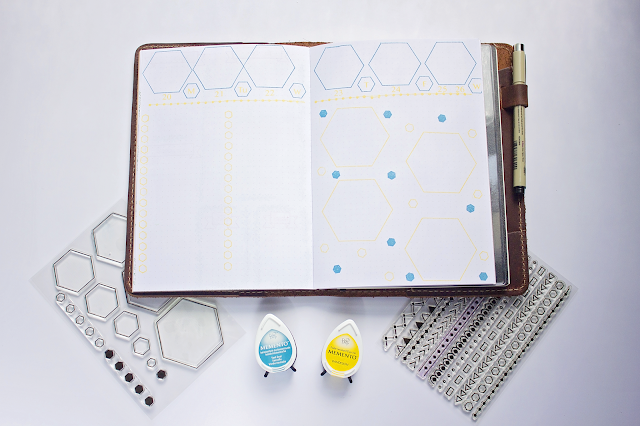 Can you believe this entire spread is made with only three stamp sets? 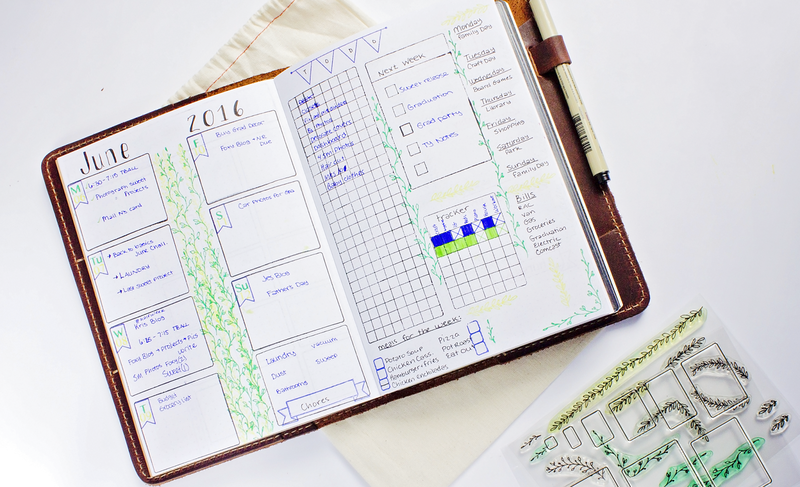 All the framework is done with the Floral Page Layout Design 1 set, and the days, dates, and banners are all from Bujo Basics Part 1 and 2. 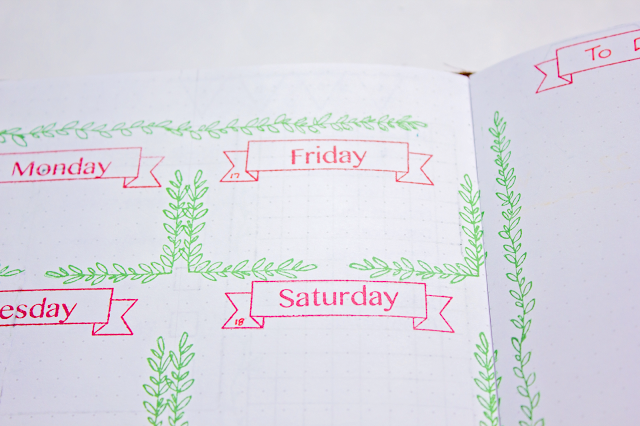 To get the florals in the right place, I drew a line down the center of the page and stamped out all the corners on either side of that line, then lined up the other half of my box with the first set of corners. 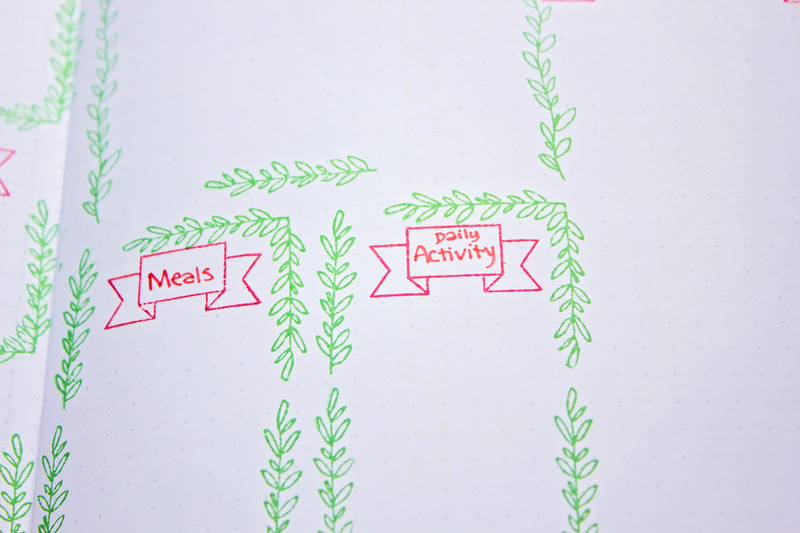 So much easier than how I did my monthly spread! If your area is too small to allow you to have four corners, you can cheat a corner using one of the straight vines, like I did here. 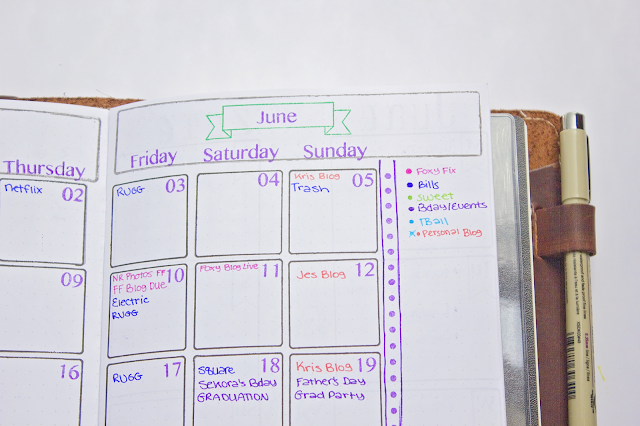 This week is extremely busy, so I knew I was going to need a lot of room for my to do list. 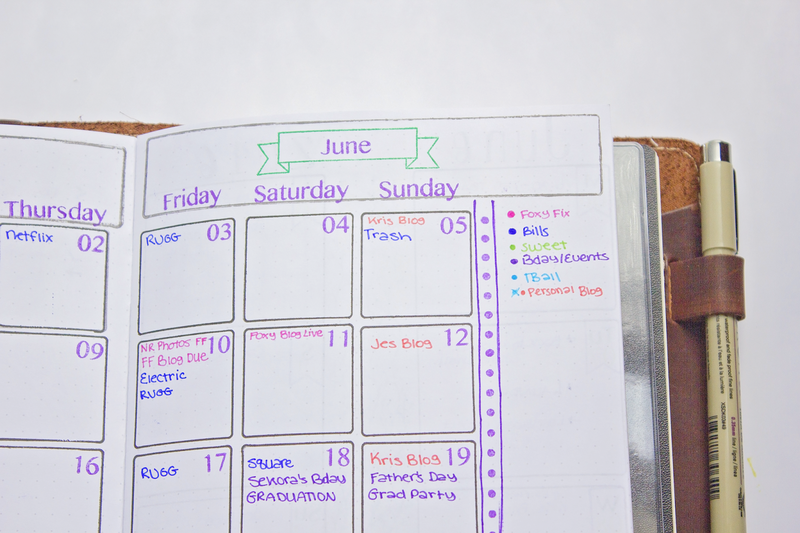 But for such a busy week, there weren't very many things that needed a specific day. The boxes at the top will be perfect for things that have a deadline, while the checklist below will help me keep my to do list straight. The weekend days share a box so that I could fit all 7 days on one page and because there is very little happening those days. 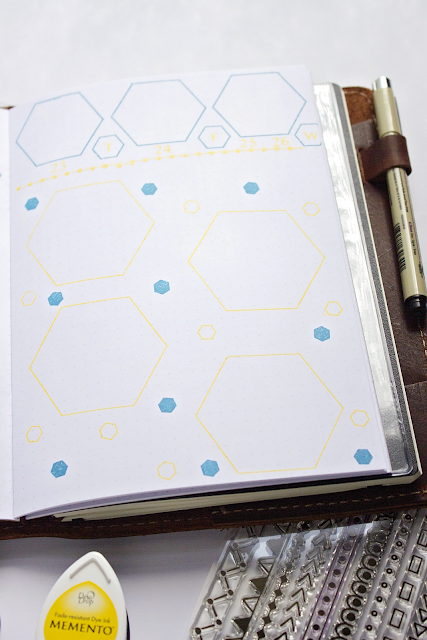 The four large hexagons on the lower part of the page will hold my notes for the following week, menu plan, daily activities with my daughter, and any bills that need to be paid. Some of you might be experienced stampers, and many of you probably aren't - regardless, you're probably all wondering how various ink brands work in the Foxy inserts. (Yes, you see Memento dye ink in these photos!) I'll post a video in a week or two showing the different kinds of ink and how they work on Foxy's paper. I absolutely loved putting these layouts together, and I hope you enjoyed this walk through of the first month in my Foxy Notebook. If you have any questions or comments, please be sure to comment below! I'd love to know what you think. 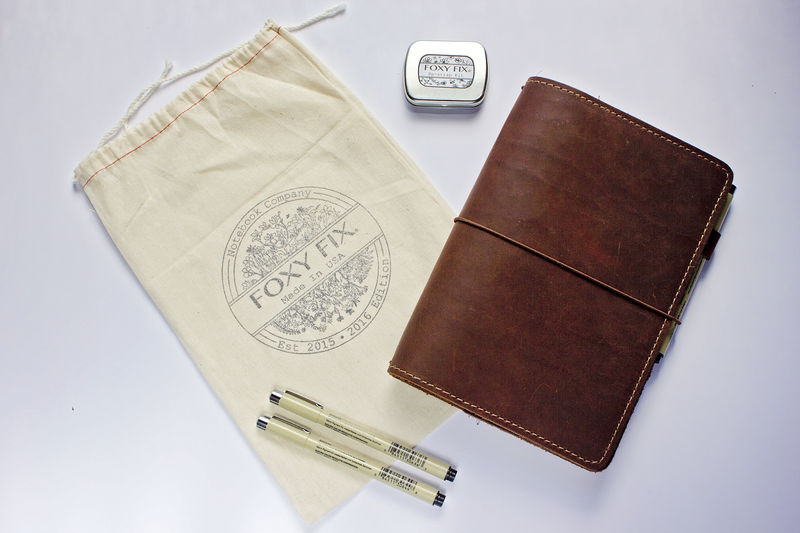 Make sure you subscribe to the Foxy Fix blog so you don't miss a post!